Warp beam stands are used for various kinds of applications, ranging from the weaving fabrics with coarse yarn counts, use of warp yarns with widely differing yarn counts or for multi-layer fabrics with a different weave-in of the binder yarn. The warp beam stands are designed with the latest technology and especially for the easy handling of the warp beams during loading and unloading; and incorporate electronic controls for feeding the required amount of yarn with the requested tension to the weaving machine. The larger the diameter of the beams the longer the length of the warp that can be wound on to it and the fewer the warp changes required, but the greater the tension variations that have to be compensated. The most modern machines can take warps of up to 1100mm in diameter. If even larger diameter beams are needed for very coarse yarns, the beams can be placed onto separate warp beam stands outside the weaving machine. They can be placed either above or behind each other. The warp beam stands are designed for standard warp beam tubes with diameters from 150mm to 270mm, a warp beam flange of up to 1600mm and a weaving width of 120cm to 540cm. The warp beam support on the stands is available for all key warp beam end pieces like square holes, shafts and EURO type. Thanks to their rugged design the warp beam stands ensure a high load absorption. Loading capacity can go up to 5000kg per warp beam, e.g. for PP fabric or for technical fabrics like glass. Warp beam stands can be designed for all conceivable weaving circumstances. In the area of narrow weaving in particular, the warp yarn is stored on several partial warp beams. To control the warp tension, a weight-loaded friction brake, either on the warp beam flange or on a drum, is used. This cannot be the optimal solution for high quality, elastic fabrics. Existing warp beam stands can often be converted to state-of-the-art technology for constant warp tension from full to empty warp beam. If requested, solutions for new warp beam stands are also possible. The warp beam stands are for standard warp beam tubes with a diameter of 80mm to 220mm, warp beam flanges up to 1000mm for JUMO beams and for a maximum weaving width of up to 100cm. The warp beam support on the stands is available for all key warp beam end pieces. The correct function of the warp beam frame depends on various parts. The back rest roller is one of them, as it balances the warp tension and acts as tension measuring for the electronic let-off controller. Furthermore the back rest roller motion is important for improving the efficiency of the weaving process, especially when the weaving machine’s speed is increased. Weak and low twist yarns need a back rest roller with a low mass and a back rest roller with a highly rigid body is needed for heavy warp tension. 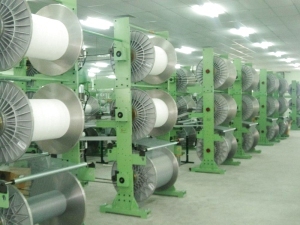 The surface treatment is also important for the warp yarns and therefore affects fabric quality.